A funeral home, funeral parlor or mortuary, provides burial and funeral services for the deceased and their families. These services may include a prepared wake and funeral, and the provision of a chapel for the funeral. Many people in Pittsburgh select a funeral home because it is close to their church and/or the cemetery where the interment will take place. Location is just one factor based on convenience. However location is not always the best method for deciding on which funeral home to use because some funeral homes are better than others. Funerals are important and unforgettable family events. The more advice and insight you can get before selecting a funeral home in Pittsburgh, the better. This is why the Funeral Home Selection Advisors at Rome Monuments, Cris Morgan and Vince Dioguardi are always willing to share their industry knowledge with families that want the best funeral service possible within their budget. You can trust us to point you in the right direction. We deal with funeral homes and cemeteries on a daily basis and have been for 4 generations. We know the best of the best. We can even provide you with the name of the funeral director, his phone number and in some cases his email address. Click here for a list of select funeral homes in Pittsburgh and Allegheny County, Beaver County, Butler County, Fayette County, Greene County, lawrence County, Washington County and Westmoreland County Pennsylvania with website addresses, phone numbers and street addresses. 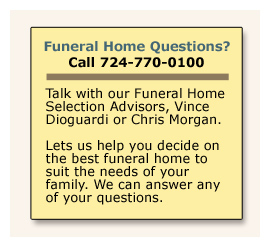 There are hundreds of funeral homes in Pittsburgh, Allegheny County, and Western Pennsylvania. The best way to learn how to choose a funeral home, funeral provider or cremation provider is to start by speaking with a Funeral Home Selection Advisor here at Rome Monuments. With seven locations throughout the Pittsburgh metropolitan area, we are UNIQUELY QUALIFIED to provide good advice, tips and useful recommendations on finding a funeral home to meet all your needs. In addition, our work as memorial builders puts us in touch with families that have already gone through the burial or cremation process and are happy to give us feedback on their personal dealings with funeral homes. You can talk to our Funeral Home Selection Advisor or schedule a free consultation by calling 724-770-0100. Click here for funeral home products, services and prices in Pittsburgh, PA.
What city should the funeral home be located in? Do you want to work with a funeral home that is religiously or culturally affiliated? If you’re planning a cremation, do you want to work with a funeral home that operates its own crematory? If planning a burial, do you want to work with a funeral home that operates its own cemetery? Your level of comfort: Do you feel like the funeral director understands the type of funeral you want and is committed to helping you achieve your vision and beliefs? Will the funeral home director or sales representative answers all your questions and provides you with accurate information and guidance? Goods and services: Does the funeral home offer the goods and/or services that you’re interested in purchasing? Pricing: Does the funeral home offer these goods and services at an affordable price? Amenities: Does the funeral home have the type of facilities you need, such as handicapped bathrooms, a private holding room before a service, etc.? Religious and cultural considerations: Does the funeral director understand your religious or cultural needs and has the funeral home ever prepared a funeral according to your religious or cultural customs? Rome Monuments will let you know all your options with respect to your preferences for disposition of the body. For instance, some people scatter cremation ashes without realizing they have the option of burial and other types of memorialization. Others may have a particular type of memorialization in mind that cemetery rules do not allow. If you decide on memorialization, you’ll be amazed at the variety of burial and cremation options available to you. Browse the Design Gallery to see pictures of bevel headstones, slant markers, upright and boulder monuments, bench memorials and bronze markers. As memorial builders, Rome makes it our priority to be fully informed and up-to-date on everything you need to know leading up to and following the death of a loved one. We have Certified Cremation Counselors and active members of The International Cemetery, Cremation and Funeral Association (ICCFA) on staff ready to help you through the complicated process of picking an affordable and reliable funeral home. You can talk to our Funeral Home Selection Advisor or schedule a free consultation by calling 724-770-0100. We will be happy to answer all your questions. Click here for a a list of select funeral homes in Pittsburgh and Allegheny County, Pennsylvania with website addresses, phone numbers and street addresses. Funeral homes in Pittsburgh will help surviving friends and families to coordinate the essential administrative paperwork and permits associated with a funeral and burial. Pennsylvania Funeral Directors Association: The Pennsylvania Funeral Directors Association (PFDA) which was organized in 1881 is one of the largest state funeral directors association in the United States. The organization is a member of the National Funeral Directors Association. This group informs and educates funeral directors, the public and government regarding the value of funeral service and licensed funeral directors on a pre-need, at need and post-need basis. Funeral Planning Checklist from The National Caregivers Library. It is one of the largest single sources of information and tools for caregivers and seniors in the United States. The Pittsburgh Institute of Mortuary Science has been providing training for students entering funeral service for nearly seventy years.